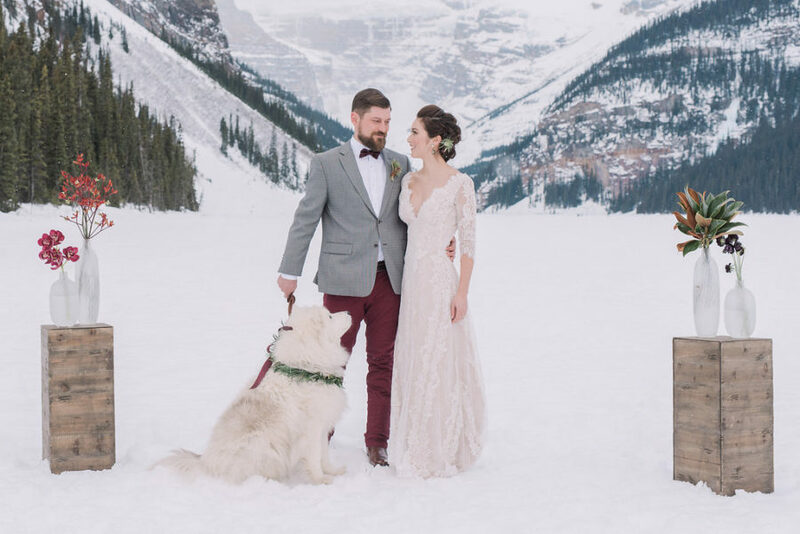 I’d been dreaming of a snowy owl / dog sled winter wedding inspiration for some time before teaming up with Kim Payant of Kim Payant Photography this past January. After a meeting over coffee we decided to make it a reality! We got to work and teamed up with some amazing wedding creatives including the beautiful Silvertip Resort, Flowers by Janie, and Stephanie Roy of Styling Steph and Snowy Owl Dog Sled Tours Inc. to put our plans into action this past February. Good things happen when you collaborate with talented wedding creatives and great photography! We are beyond thrilled that this shoot was featured on the Wedding Bells Magazine Blog !! If you’ve missed it check our the post on their blog here. There’s lots more beautiful photos and winter wedding inspirations. I’ll be doing another post with more photos soon too! Here is a collection of some of my favorite shots from the shoot. The snowy owl dogs are just gorgeous and so well-loved and taken care of. They had the most beautiful coats! Playing with the team /Photo by Kim Payant Photography. 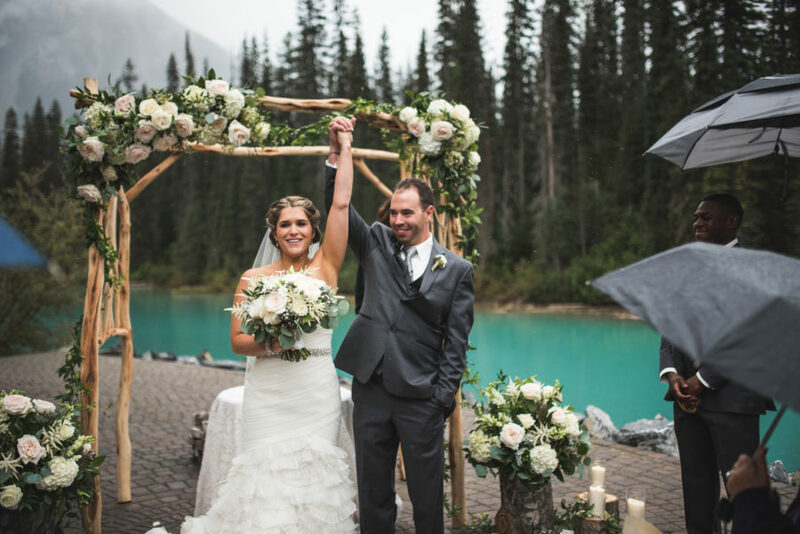 Silvertip Resort provided the mountain backdrop and we couldn’t be more thrilled to have local Canmore couple Jenna and Gibson Rencz be our “bride and groom”! Janelle Gerstein of Flowers by Janie made this beautiful winter bouquet! It was a cool winter’s day but Jenna and Gibson shone! Canmore winter wedding couple / Photo by Kim Payant Photography. I LOVE Jenna’s hair styled by Stephanie! Jenna just looks gorgeous, wouldn’t you agree? For our “reception” decor, I chose a snowy owl / feather motif. I am a huge fan of the beautiful majestic Snowy Owl, normally considered an arctic bird; it seeks refuge from the harsh arctic winter and winters in many Southern Canadian areas including Southern Alberta. The male owl is a pure snowy white, while its female counterpart is white with grey and black plumage. The colors of the owl became the color palette for our decor along with a blush pink, taken from the barely there blush hue often found in the skyline at dusk on a cold winter’s day (and in Jenna’s wedding dress)! In keeping with the with the white, black and grey theme, I used real marble to make the place cards and menu for our table. For a wedding favour, I used birch wood discs and engraved a snowy owl on each disc. Kim made the delicate, spun sugar nests we used to adorn each place setting (she’s not just a photographer!) and the whimsical, snowy owl felties are from former Canmore resident Laurel Brown of Lucky Lemon Felties. Naturally Chic made the marble place card holders. Beautiful feather linen provided us with a romantic sweetheart table. Our guests table were clean and contemporary with felt chargers and natural, grey linen napkins. Our table numbers were an easy “DIY” wedding project. We used reclaimed house numbers and attached them to a light maple wood for a modern, graphic look. If you don’t have a dog-sled team at your wedding (though Snowy Owl is available for weddings in the Canmore area), a sweet table is the highlight of any wedding! No surprise that ours was “Snowy Owl” themed! Whimsical white owls, soapstone carvings, a DIY feather garland and lots of pink and white treats made up our sweet table. Stay tuned as we will share more photos and inspiration from this winter shoot at Silvertip Resort. Contact us Naturally Chic or Canadian Mountain Chic for more information on planning your Canadian Rocky Mountain, winter wedding! Happy Planning! Yesterday we shared Part One of Jena and Gordon’s Canmore summer wedding, if you’ve missed it you can see it here. Today we are thrilled to share more of their fun Canmore wedding. Jena and Gordon are one of the nicest couple’s to work with. They are just so nice…and always smiling and having fun! It was a pleasure working with them on their summer wedding that took place at the Silvertip Resort in Canmore, Canada. Jena and Gordon’s wedding party joined them for a photo shoot before the reception. Here’s a few pics of them with their wedding party. The girls | Photo by Eric Daigle Photography. Jena and Gordon wanted simple, rustic wedding decor with a little flair (that suited their personalities)! They chose a purple, white and grey color palette, with wood accents for their reception. We created a 20 ft. purple paper poms and fan backdrop for their head table. It was very fun and whimisical and really suited the couple’s wedding vibe. We made menus and place cards for each place setting. The place cards had real wood accents which added a rustic flair. In keeping with the rustic theme, Jena and Gordon chose simple floral, mason jar arrangements from Occassional Bloom. We made wood table numbers to complement the rustic theme. Food at the Silvertip Resort is always phenominal! The lovely cake was by Barbara Laberge formerly owner at Cake Creations in Canmore (the topper was from Etsy). Jena and Gordon’s wedding favours were personalized, all natural soap from the Rocky Mountain Soap Company. I love that this natural soap comes in so many wonderful scents to choose from and it is even better when it is personalized! We wish you both a lifetime of happiness Jena and Gordon!! Beautiful Shot of Jena and Gordon on location at Silvertip Resort. Happy Planning! For more information about our wedding planning and design services contact us at hello@naturallychic.ca or call 1.888.679-9056! Wedding Favors- Rocky Mountain Soap Co. I had the immense pleasure of working with Jena and Gordon on their Canmore summer wedding at Silvertip Resort. Jena and Gordon are incredibly warm, loving and fun and it really shows in all their wedding photos taken by the talented Eric Daigle of Eric Daigle Photography, a local Canmore resident! Canoe theme wedding stationery | Photo by Eric Daigle Photography. Jena and Gordon’s wedding rings | Photo by Eric Daigle Photography. Jena and Gordon stayed at the beautiful Grande Rockies Resort in Canmore and Jena and her girls stayed in the beautifully appointed Penthouse Suite overlooking the Three Sisters Mountain Range. Canmore bride | Photo by Eric Daigle Photography. Where to Get Married in Banff, Canmore, Lake Louise, Jasper and Beyond! Where to Get Married in Banff, Canmore, Lake Louise, Jasper and the Canadian Rocky Mountains? You’re newly engaged and embarking on the wonderful world of wedding planning! One of the first steps for a newly engaged couple is to decide where to get married! If you’re reading this post, we’ll assume you are envisioning a destination wedding in the beautiful Canadian Rocky Mountains! 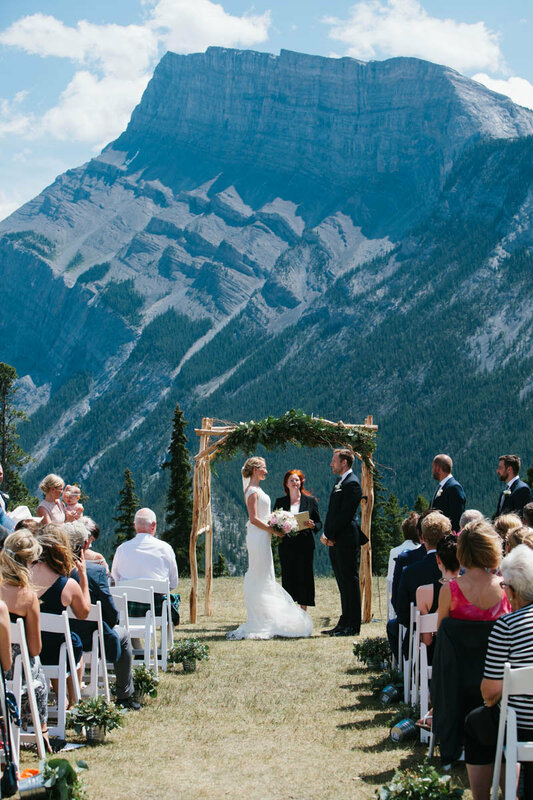 Many couples immediately think of Banff when they think of a wedding in the mountains and why not? You’ve probably spent time in the mountains skiing or snowboarding, hiking or enjoying the shops in Banff. Perhaps you were engaged in the mountains and find it a natural fit to be married in the mountains. Although Banff has many wonderful places to get married, there are numerous venues in the area to suit almost any couple’s style and budget. Buffalo Mountain Lodge is a classic mountain lodge with amazing Rocky Mountain Cuisine and is within close proximity to “the meadow” (a popular outdoor ceremony spot with a fabulous mountain view). It’s perfect for smaller to medium weddings (under 100 people)! The Wapiti Longhouse is a beautiful space with wood beams, stone fireplace, and hardwood floors! The Rimrock Resort with equally stunning views of the mountains and Bow Valley is also worth a look if you are wanting more of a large ballroom style wedding. They offer exceptional service and their food and beverage staff are amazing! They have some beautiful onsite ceremony spots and can easily accommodate small or large weddings (weddings over 100 people). The Fairmont Banff Springs is a timeless choice for sure. Many brides have long envisioned their Fairytale Wedding at the Castle of the Rockies. With exceptional service and beauty, it certainly is a perfect choice for a ballroom wedding! There are, however, other amazing venues that might be worth considering! Can accommodate small or large weddings. All three of these Banff venues have onsite guest accommodations. Silvertip Resort is a stunning mountain venue suitable for small to large weddings! Their reception spaces have beautiful wood beams and rustic decor. They have delicious food and catering services. They have numerous patio spaces and gazebo lookout for ceremonies. No accommodations on site, but many venues available a short distance away. Stewart Creek Golf Resort is equally stunning! It is suitable for smaller to medium weddings with on-site ceremony location. They have wonderful food and service, but space is available to non-members from October to May only. Stewart Creek, much like Silvertip Resort, does not have accommodations on site (but don’t worry Canmore has some of the best guest accommodations anywhere in the Canadian Rockies!) and they do have a shuttle available. 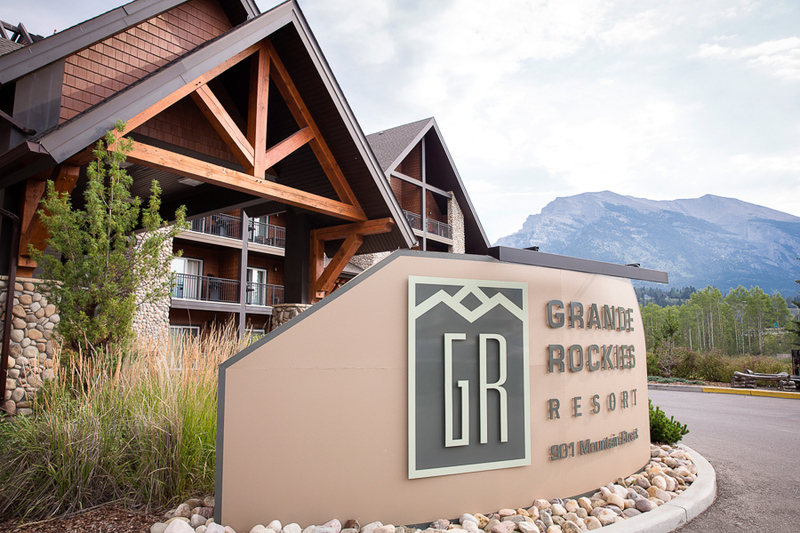 The Grande Rockies is a newer, contemporary wedding venue in the heart of Canmore and within walking distance to most amenities. They offer modern reception spaces and top-notch cuisine. They have excellent service and gorgeous guest accommodations onsite. They do have an outdoor ceremony space which is super convenient if you and your guests are staying at the hotel. The Fairmont Chateau Lake Louise is an amazing facility with the most beautiful lake views, superior service, and accommodations; perfect for ballroom weddings. They can accommodate small weddings to extra large weddings (200+). Deer Lodge is a historic lodge steeped in history with amazing food. It’s within walking distance from Lake Louise, although they do have on-site ceremony locations suitable for weddings. You can buy out the entire lodge for weddings and have the whole place to yourself! It’s a stone throw away from adventure! Baker Creek Chalets is another of my favorite wedding venues in the Rocky Mountains. It is in a secluded wooded area with streams, wildlife and hiking (or cross-country ski trails) all around. The cabin accommodations are beautifully appointed in all things Canadiana! There are some on-site ceremony locations suitable for smaller weddings, but you may want to consider getting married at Moraine Lake (which is a short distance away) and then having your reception back at the chalets. The food is amazing! Suitable for small to medium small weddings. I’ve had the pleasure of working a wedding at both the Jasper Park Lodge and the Sawridge Inn in Jasper and have had excellent experiences with both. The Jasper Park Lodge has a beautiful ceremony site right on the lake, and lodge and cabin accommodations. 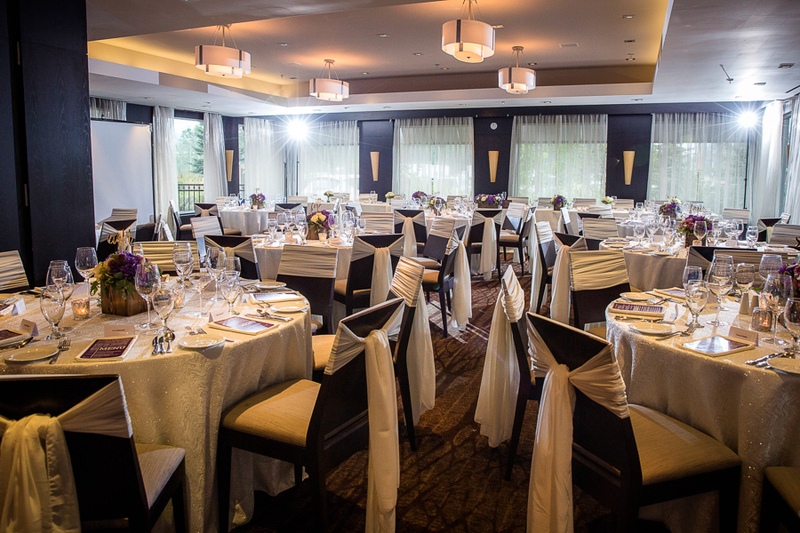 The Sawridge can host small to large weddings and offer excellent food and nice accommodations. Emerald Lake Lodge is simply one of the most gorgeous venues anywhere and one of my absolute favorite wedding venues! Even Martha Stewart Weddings has recognized it as a fabulous wedding venue (did I mention she mentioned us too :)! We have heard so many of our couples say it is “the most romantic place on earth” and “magical”! The place has a very secluded feel, especially if you book out the entire “island”! Island Lake Lodge is another amazing option off the beaten path, also with amazing food and views! There you can have a lake ceremony surrounded by mountains, old growth cedar trees and stay in beautiful lodge rooms (in winter they offer cat skiing right out the doors). It’s located in close proximity to Fernie, BC (just a couple hours away from Calgary, Alberta) but is remote at the same time, and you can book the whole lodge for your wedding! The Ranche Restaurant is operated by the Great Events Group. The historic building located in Fish Creek Park offers a rustic, vintage ambiance and a private outdoor ceremony spot. I love weddings there in part, because of their secluded location; it’s like being in the mountains! Another great wedding we love that is in the foothills of the Rocky Mountains is The Lake House and is operated by CRMR. It’s an amazing venue if you want a contemporary, modern rustic wedding venue in the city. It’s located on Lake Bonavista in Calgary and it’s the next best thing to being in the Rockies! This is, of course, just a brief overview of these wonderful wedding venues (we are so lucky in this area right?)! You may also be interested in this post on 5 Tips to Know Before Booking Your Wedding Venue. Need help to find a wedding venue, Naturally Chic can help or see our wedding venue directory on our sister site, Canadian Mountain Chic. from Banff Wedding Planner Naturally Chic. Contact us at hello@naturallychic.ca.